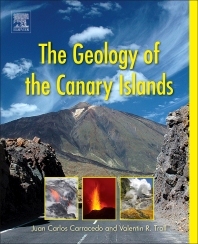 Through its clearly written and richly color-illustrated introduction and field guide, this book is essential reading for geologists who visit the Canary Islands, one of the largest and most fascinating active volcanic systems in Europe. Geologists and geology students, Volcanologists, Geophysicists and Geochemists. Valentin R. Troll graduated from St Andrews University, Scotland in 1998 and received his PhD from the IFM-GEOMAR Research Centre at the University of Kiel, Germany, in 2001. Troll then lectured in volcanology and petrology at Trinity College Dublin (2001-2008), during which time he also habilitated at the Université Blaise Pascal Clermont-Ferrand, France in 2006. In early 2008, he took up the Chair in Petrology and Geochemistry at Uppsala University, Sweden, which he currently holds. Prof. Troll has worked on the volcanic phenomena of the Canary Islands since the late 1990s and has co-authored some 50 scientific articles on the geology, petrology, and geochemistry of the archipelago. Since 2008, he is an honorary research associate at the Intituto Nazionale di Geofisica e Vulcanologia in Rome, Italy, and since 2012 also at the University of Las Palmas de Gran Canaria. Troll is mainly active as a research professor at Uppsala University, but strongly believes that training young scientists, watching them grow and helping them to capitalise from experienced researchers is vital for securing the future of volcanology and petrology, as well as the future of our society as a whole. Troll was recognized with the “VMSG Award 2011” by the Volcanic and Magmatic Studies Group, United Kingdom, the volcano section of the Geological Society of London) for “significant contributions to our understanding of magmatic processes over the last few years”. He also received a “Most Cited Paper Award” from the ”Journal of Volcanology and Geothermal Research” (Elsevier) for the period 2003-2007 and is an elected Fellow of the Mineralogical Society of Great Britain and Ireland and of Trinity College Dublin. From the latter institution he also holds an honorary M.A. degree for “outstanding service." Juan Carlos Carracedo graduated from the Universidad Complutense (Madrid) in 1968. After a postgraduate sojourn at the Department of Geology of the same University and followed by a spell as a visiting scientist at the Department of Geology, University of Toronto, he took up a permanent position on the staff of the Spanish Research Council (CSIC) at the National Museum of Natural Sciences (Madrid) from where he later moved to the Estación Volcanológica de Canarias (EVC-CSIC) in La Laguna on Tenerife. Prof. Carracedo has worked in the Canary Islands for over 40 years and published over 200 scientific articles on the geology, palaeomagnetism and volcanology of the Canary archipelago and authored or co-authored over 20 books and book chapters (in Spanish and English). Although Prof. Carracedo believes that the main role of a scientist is to communicate findings to peers, he is also strongly convinced of the importance of scientific outreach as an essential way to transfer knowledge to the general public, as well as to the next generation of geoscientist working in the archipelago. He hopes to spark interest and wants to help make science relevant to peoples’ every-day lifes. This is of particular importance in the Canaries, an area with active volcanism, where a good general knowledge of volcanic processes and associated hazards may significantly help to facilitate the management and responses to future eruptive hazards. Carracedo recently retired as a ‘distinguished research professor’ from CSIC and as director of the Estación Volcanológica de Canarias (EVC). Prof. Carracedo is currently an honorary emeritus professor at the University of Las Palmas de Gran Canaria (GEOVOL-GROUP) and was recently named as one of the most influential scientists in Spain by a national survey in early 2015. In recognition of the latter, he was appointed a member of the “Canarian Royal Academy of Sciences” in summer 2015.